Backyard Spiders. Budgewoi to Bateau Bay. This site was built with assistance from the following sites and people. We recommend them for further information and identification and thank their builders and owners for the excellent resources they have provided. Dr. Ron Atkinson's. 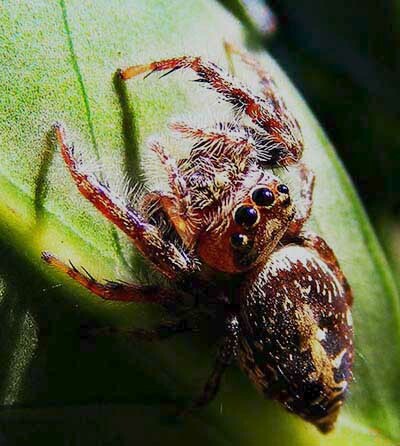 Find A Spider Guide. Robert Whyte and Dr. Greg Anderson's Arachne.org. The Chew Brothers' Brisbane Insects. Ed Nieuwenhueys. 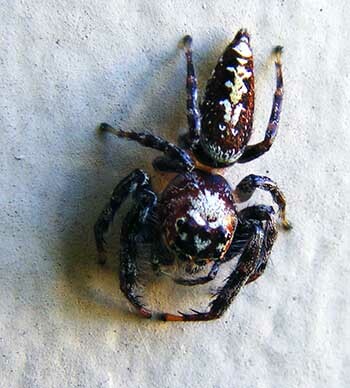 Spiders of Australia. as well as Project Noah. 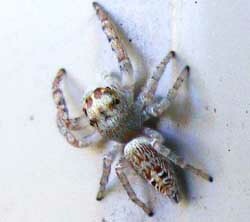 The female above was between 15 and 20mm which is quite a large and stocky jumping spider. They seem to prefer bushes with wide, spacious leaves they can use as platforms or hide beneath when hunting. 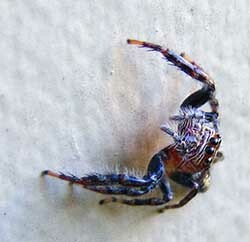 The spider above was stalking a spider-hunting wasp which she dispatched with no trouble. She seemed to be quite slow but the wasp must have taken a turn of speed. She saw me coming for some distance and was difficult to photograph as she kept running around the leaf. The image was only taken after she had been running aound the leaf from the top-side to the under-side for a few minutes. Both of these spiders were photographed at Budgewoi on the Central Coast of NSW Australia. There have been no spottings here yet and I suspect there will not be. The habitats here are far enough from what was found at Budgewoi to ensure a different range of findings.